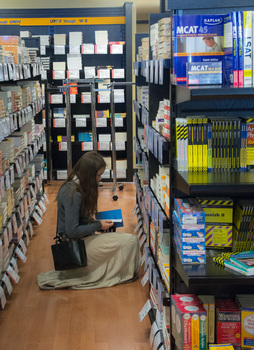 Eli's Books features an expanded, 11,000 square feet, floor plan. Patrons in line at the Starbucks at Eli's Books. 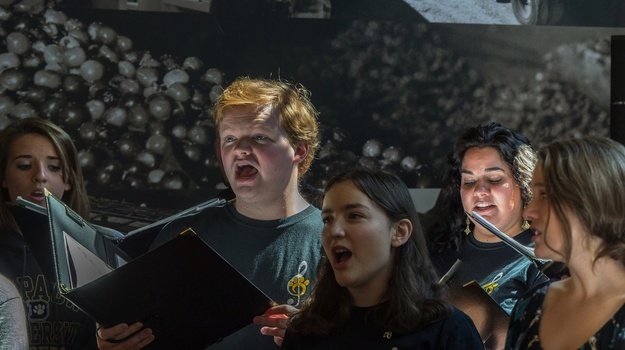 Vocalists from DePauw's School of Music perform at the grand opening of Eli's Books. 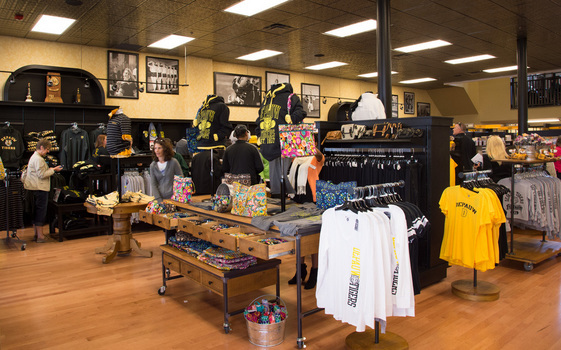 Eli's Books carries textbooks, best-selling fiction and non-fiction, along with DePauw apparel. Eli’s Books is DePauw University’s official bookstore and is located on the courthouse square in downtown Greencastle. 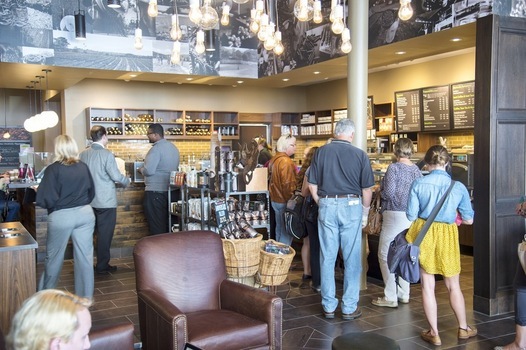 Originally located in the basement of the Union Building, the bookstore relocated to the renovated space in September of 2012 and now features an expanded floor plan of 11,000 square feet and a full-service Starbucks café. The new space also features mezzanine level seating for Starbucks that is perfect or studying or socializing, as well as community room available to all DePauw and Greencastle Community members, free of charge. Eli’s Books is named after Colonel Eli Lilly, an avid book collector and founder of the Indianapolis pharmaceutical company Eli Lilly & Company. Lilly, beginning in 1853, attended the Academy at Indiana Asbury University, which would eventually become DePauw University. After an apprenticeship with a pharmacist in Lafayette, Ind., Lilly would open his first drug store in Greencastle in 1861 (on the southwest corner of the intersection of Indiana and Washington Streets). During the Civil War, Lilly served with the Eighteenth Indiana Battery of Light Artillery and with the Ninth Indiana Cavalry. He rose to the rank of Colonel before he left the service in 1865. After brief periods living in Port Gibson, Miss., and in Paris, Ill., Lilly would eventually return to Indianapolis, establishing the Eli Lilly & Company in 1876. Today, his legacy lives on in the continued success of the business he established and in the philanthropic organizations—such as the Lilly Endowment—that carry his name. DePauw University moved the bookstore to the courthouse square as a part of a community-wide development effort spurred by Greencastle being selected as a Stellar Community – a state agency initiative promoting comprehensive community planning amongst Indiana’s smaller communities. The bookstore and Starbucks café will serve as the retail anchor for the square, while several other buildings around the courthouse square will have their original facades restored and streetscapes will be completed on and around the square. Today is faculty and staff appreciation day at Eli's Books! 25% discount, free gift wrapping, and delicious treats now until 7 pm. Stop by! Can you beat Gru and his minions? Stop by Eli's and prove you have the best costume! Stop by Eli's any time tomorrow to enter our costume contest! Make this Halloween spooktacular! !